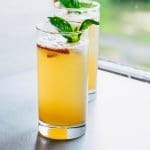 These easy Peach Bourbon Spritzers are the perfect easy cocktail for late summer and early fall! 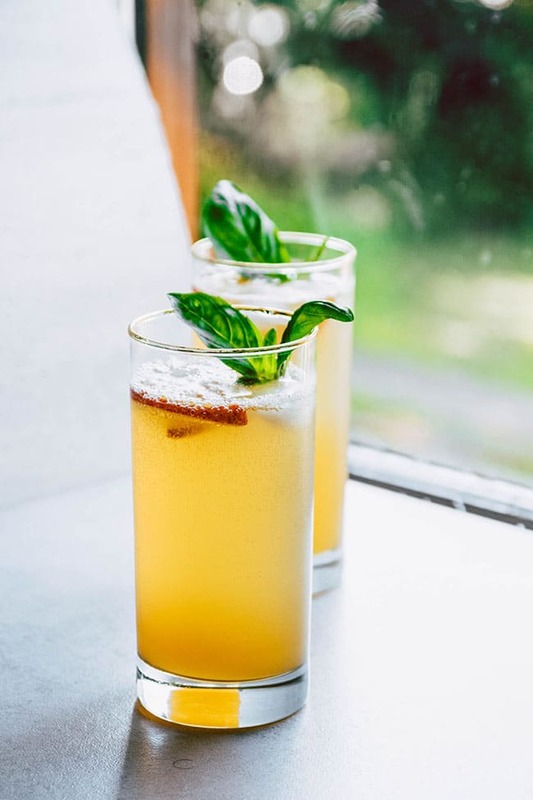 A quick homemade peach simple syrup, bourbon, and a mint or basil garnish make this peach cocktail a hit. Internet friends! I think we deserve a drink. 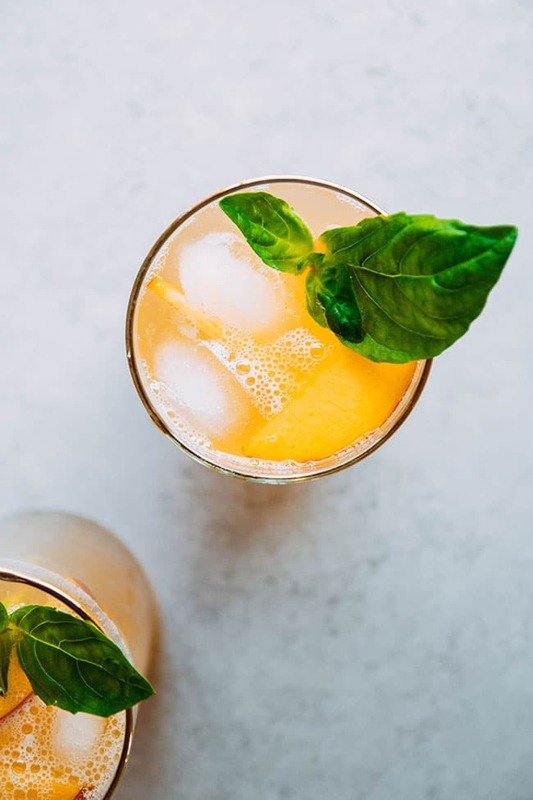 These Peach Bourbon Spritzers are one of my go-to peach cocktails every summer – but the peach syrup works just as well with frozen peaches, so you could make it any time of year! 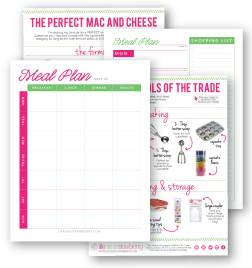 Here’s what it takes (spoiler alert: this is SO EASY). This is a very simple, very FORGIVING bourbon cocktail recipe (huzzah!) so don’t be afraid to play with the flavors! Bourbon and whiskey are great here, and you can swap the peaches for fresh berries if you want to mix it up a little bit. 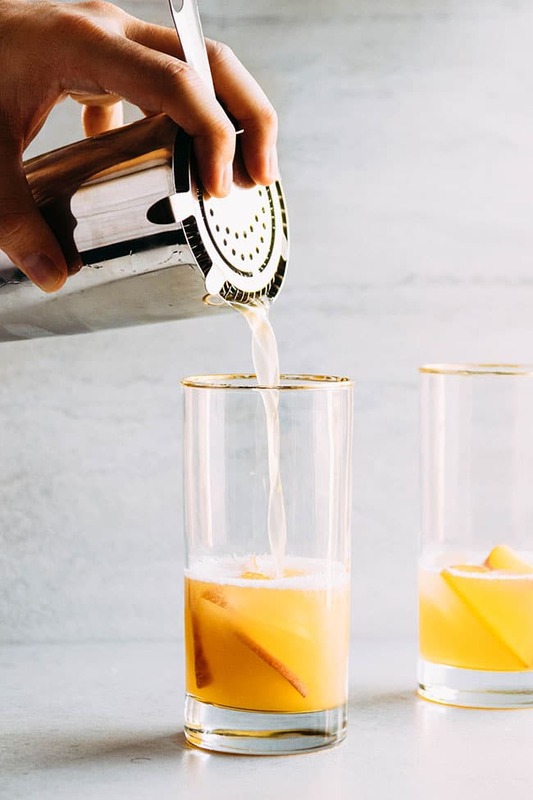 You can also mix the peach syrup, lemon juice, and bourbon ahead of time and keep it in the fridge until you’re ready to serve – just top the drinks off with tonic water at the very end! Leftover or pre-made peach syrup will keep well in a jar in the fridge for up to a week. 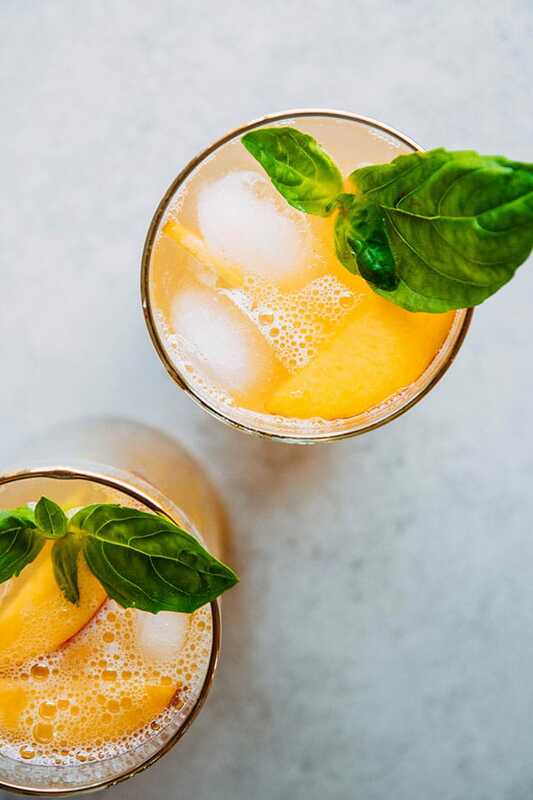 Peach bourbon spritzers are the perfect summer cocktail! Combine all ingredients in a small saucepan. Cook over low heat, stirring frequently, until sugar has dissolved and peaches have softened, about 15 minutes. Set aside to cool for 10 minutes. Place peach syrup, lemon juice, and bourbon in a cocktail shaker. Add ice and shake well to chill. Divide cocktail evenly between four cocktail glasses filled with ice. Divide tonic water evenly between cocktail glasses. Top with fresh peach slices and herbs (optional) and serve immediately. EQUIPMENT USED HERE: I use a simple steel cup and bar strainer (pictured above) for my cocktails! This recipe is great with any bourbon – some of our favorites for cocktails are Maker’s Mark, Four Roses Small Batch, Bulleit, or Buffalo Trace. Use whatever bourbon you like to drink, or substitute your favorite whiskey. If you don’t like bourbon, you can substitute vodka here, but be aware that you’ll lose some of the depth of flavor that comes from the bourbon. Save any extra peach syrup in an airtight container in the fridge for up to a week and use in your favorite cocktail recipes. This recipe makes four small cocktails or two large cocktails. As always, please drink responsibly. LOVE THIS RECIPE? Try my easy Blackberry Whiskey Lemonade next!